I have had this wallet for years and carry if with me everyday. It has weathered well and is still looks great. It is so comfortable I have to "tap" my pocket to ensure that it is with me. Walking, standing, sitting I have no issues with how it rides in the front pocket. Initially purchased the wallet because of back pain. That has not been an issue since using Rogue Industries Front Pocket Wallet. Thank you Michael and Wells for bringing such a great product for us to use. this wallet is great and provides security also . I got this wallet mainly for extra security from pick-pockets and card skimmers which seem to be everywhere these days . I was pleasantly surprised at the quality and workmanship of this wallet .It is very comfortable and holds most of what I need . Bought it for my husband and he loves it. He was concerned at first that it might be too big but the shape is perfect and allows for easy accommodation of bills. My fiancé doesn’t normally carry a wallet because they are too bulky. He loves how thin this wallet is. He loves that it is real leather. He’s been using it and loves it! Excellent for traveling and not having to sit on a lump! Absolutely beautiful design, high-quality craftsmanship! This wallet was a big hit in the gift department. It was pretty good quality and seemed to be exactly as advertised. This has really helped my husbands back pain by shifting his heavy wallet from his back pocket to the front pocket. However, I had to return the one I purchased for my husband. I bought it because he was in a major flare of sciatic pain from a motor vehicle accident, however, while he appreciated the thought, he said he couldn't even put a quarter in his pocket without it causing pain, so I returned it. It was a gift and it was well received. 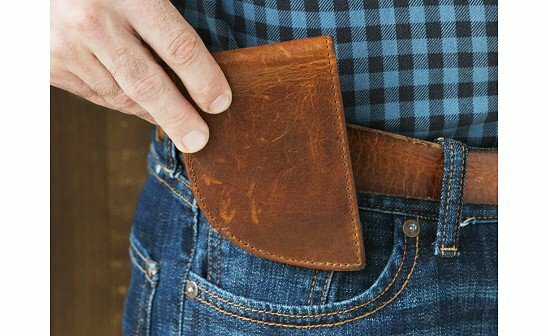 Michael Lyons began designing men’s front pocket wallets when he couldn’t find the right one for himself. 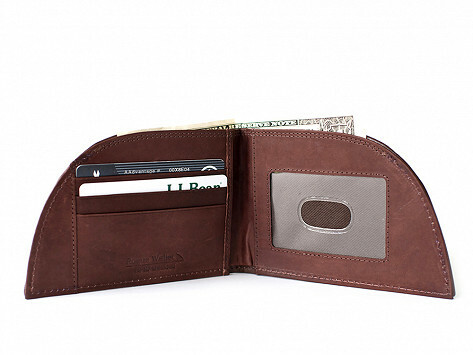 Now along with his son Wells, he makes curved wallets to fit easily into curved front pockets. Michael made the switch to the front pocket to make his back feel better. A trip to the doctor left him with a prescription to stop storing his wallet in his back pocket. It might sound like an odd diagnosis, but it proved true for Michael. And since most of the wallets he found were square or rectangular, they didn’t fit as well as they could—which spurred him to create Rogue Industries.